Historically, and in the big picture that is the New England music scene, Brad Hallen is probably the best unknown four stringer around. 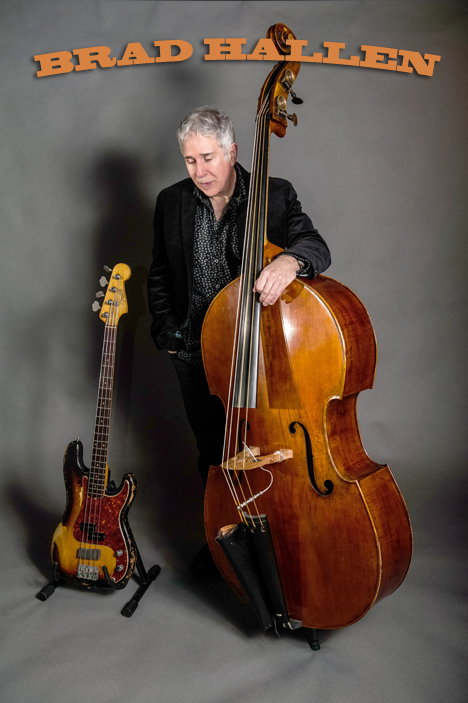 Over the years he has had great success in a number of different genres and his inspirational bass playing is the stuff of legends. Check out Brad digging deep into his past to answer my questions. Noise: In your 35 years of recording credits and personal history there appears to be a gradual musical evolution in your bands. From 1980 to the mid ’90’s you were in rock groups and appeared on albums and onstage with punk icon Willie ‘Loco’ Alexander, Elliot Easton, Rick Ocasek and Ben Orr from new wave icons The Cars, Industrial Metal headbangers Ministry, Aimee Mann from ‘Til ‘Tuesday, Pastiche (and winning the WBCN Rock ‘n Roll Rumble in 1980), The Joneses, (who did a killer cover of ‘Soul Survivor’ on 1994’s ‘Boston Gets Stoned’ compilation release under the band pseudonym Torn and Frayed), The Nervous Eaters,The Outlets, Primary Colors, Adventure Set,The Soul Band, Dennis Brennan, and Susan Tedeschi. Also Jane Wiedlin (The Go Go’s) and Iggy Pop on a national level. From then until the present your music resume shows your presence in releases from Peter Malick, Roomful of Blues, Grammy Award winner Tom Hambridge, Johnny Winter, ‘Monster’ Mike Welch and for the past 6 years with blues legend Duke Robillard. You have just released a jazz CD with your own band The Evenfall Quartet. What do you attribute your music production in specific genres to specific periods in your life? Why did you start out in rock, move to blues and have now just released your first jazz CD? Brad Hallen: I feel very fortunate to have had the opportunity to work with so many great artists over the years. I think it’s just been a natural evolution to grow as a musician. I have always loved all kinds of music. If you see what’s currently on rotation at my house as far as what I am listening to you would see it’s not genre specific. It wasn’t a conscious decision to start out on rock. That’s where I was at at the time. I also didn’t have the discipline it takes to study and play jazz when I was younger. As far as blues goes that’s the foundation of all roots music isn’t it? The Evenfall Quartet and playing more jazz now is just part of the natural progression of learning. Noise: What other styles of music are you interested in and play? Brad: As far as other styles of music. I love latin, cuban, salsa. I love reggae. Artists like Willie Colon, Hector Lavoe, of course Bob Marley, and all the other rock steady artists. Classical music. I try to listen to all types of music. I try and stay somewhat current with what’s happening on the rock scene today. Bands like The Arcs and The Black Keys. But I mostly play and am interested in roots music and have been spending most of my time playing upright and working on my jazz playing. Noise: Different genres require different instruments. What is the difference when you play an upright as opposed to when you perform on an electric bass? Brad: As far as acoustic bass and electric bass, I love them both and more than genre specific. I would say whatever serves the song best is what makes me decide which one to use. Of course when it comes to playing jazz I would always want to play acoustic bass. The two instruments function differently in the ensemble. For example the note travels a lot quicker on electric bass. Noise: What’s the difference between rock, blues and jazz audiences? Noise: What are some of the strangest places you’ve ever played while on tour? Brad: Strange places hmmmm – well how about Cantones? The Rat, Space, The Channel, Tennis Up, Streets, Bunrattys! It’s all the same whether you are doing a gig in Moscow, Istanbul, Paris, London or one of those fine establishments I just mentioned in Boston. Did a gig in Transylvania last year about a half hour up the road from Vlad the Impailer’s castle! Noise: Care to share quick stories about something you remember about playing with Willie Alexander, Iggy Pop and Duke Robillard? Brad: Stories ok. Willie produced Pastiche’s first single in 1980.”Talk Show” backed with “Terminal Barbershop/Boston Lullabye.” We recorded it at Downtown Recorders and it was such a great experience. I loved the Boom Boom Band and to be working with Willie was so cool. Such a sweet guy and so musical. As a result of our connection made there I was asked to play on his beautiful composition “Gin” and another single called “Carols Talking! !” Recording with Iggy Pop and him talking to me about his golf game. I have to say working with Duke has been a real treat. The man is an encyclopedia of information about American music. I have learned so much from him. Thanks Duke. Noise: What’s the craziest thing you’ve ever seen happen on the Boston music scene? Brad: What’s the craziest thing I’ve ever seen on the Boston music scene? Everything! C’mon AJ, we can’t talk about that. There was a lot of fun happening back in the late ’70s early ’80s. I’ll leave it at that. Noise: What recording are you proudest to have been a part of and why? Brad: As I said earlier, I have been so fortunate to have worked with so many talented people. Of course I am proud of The Evenfall Quartet record on Blue Duchess Records. It’s new! You can buy it on CD Baby and learn more about us by going to my website bradhallen.com. I love some of the records I have made with Duke. We have a new one coming out in September called Blues Full Circle on the Stony plain label, I loved Independently Blue which features Mike Welch, and Low Down and Tore Up. I am really proud of The Otis Clay/Billy Price record called This Times For Real which just won a BMA for soul album of the year in 2015! I am very proud of The Soul Band’s record Certified. That was a great group and a great record. The first Roomful record I did That’s Right was nominated for a Grammy I think in 2003. That’s a few. Noise: What local bands do you like on the scene today and what groups do you think should have made it big in the past but didn’t? Brad: I really like Matt Stubbs’ new band The Antiguas. They are killer. They have a steady Monday night at The Plough and Stars in Cambridge and everyone who is reading this should go see them. Great players and great songs. Dennis Brennan who has a pretty steady gig at The Lizard Lounge on Wednesday with great players. Dennis is criminally unknown on a national level. He is as good as it gets as a songwriter and performer. I can’t express in words how much I have learned from him. He has a new record coming out soon. Bands that should have made it from the past? The Nervous Eaters. Steve Cataldo is another artist who I learned a lot from. They are a great band. The Joneses!! I always loved The Neighborhoods. Noise: Any advice to musicians trying to get their music heard in these tough economic times? Brad: I don’t know what kind of advice I have for people getting their music heard these days. The music industry as we knew it is at best different. I will say this: play music because you love it. Because in the end that’s all that really matters. Brad is one of the all time greats, and Baddest bass player I’ve had the pleasure to work with. Great interview – Brad is one of the best out there today!